This is the time of year when I get my stretchy pants ready and prepare to FEAST. This year, however, I am making healthier versions of all my favorite dishes so when I go back for seconds (and thirds) I can do so with less guilt and more pleasure. I mean, if you’re gonna eat until it hurts, might as well make it as healthy as possible, amirite? This year, I had to get a jump on making this Vegan Green Bean Casserole because this baby is going to be the bottom layer of an EPIC 5 layer Thanksgiving Leftover Pot Pie. Oh yes, friends. You heard that right. This incredibly delicious Green Bean Casserole will be layered with a bunch of other vegan goodness and BAKED INTO A PIE. Savory vegan green bean casserole your whole family will love! Simple to prepare and easily made gluten-free, this is a healthy, delicious version of a Thanksgiving favorite. Boil water in a large sauce with 1 teaspoon of sea salt. Add the beans and blanch for five minutes. Drain the beans the immediately plunge them into a bowl of ice water to prevent further cooking. Drain and set aside. Preheat the oven to 400. Heat 1 tablespoon of grapeseed oil in a medium skillet. Add the mushrooms, 1 teaspoon of sea salt, and 1/2 teaspoon black pepper. Cook for 4-5 minutes until most of the liquid from the mushrooms has been released and cooked off. Add the garlic, nutmeg, and nutritional yeast and cook for another 1-2 minutes. Sprinkle the chickpea flour on to the mushrooms and stir until evenly coated. Cook for 1 minute then add the vegetable broth, non-dairy milk, and 1 tablespoon vegan butter. Reduce heat to medium low and let simmer until gravy thickens, about 6-8 minutes. Stir in 1/4 cup of fried onions. Transfer the green beans to a casserole dish. Pour the mushroom gravy over the beans, then top with the remaining cup of fried onions. Bake for 15 minutes at 400 until the mixture is bubbly. Serve immediately. Use GF Fried Onions to make this gluten-free. Casserole can be made a day in advance and stored in the fridge. Leave the last cup of fried onions off until just before baking. Bake for an additional 2-3 minutes. For more delicious Thanksgiving recipes, check out our AMAZING Vegan Gluten-free Mushroom Gravy and our Savory Portobello Shepherd’s Pie. We also have some incredible dessert options. Why not mix things up by making a stunning Vegan Pink Lemon Meringue Pie (it’s seriously SO pretty and the best pie I’ve ever had.) We also have an impressive 3 Layer Vegan Pumpkin Spice Cake that will make a beautiful addition to any holiday table. 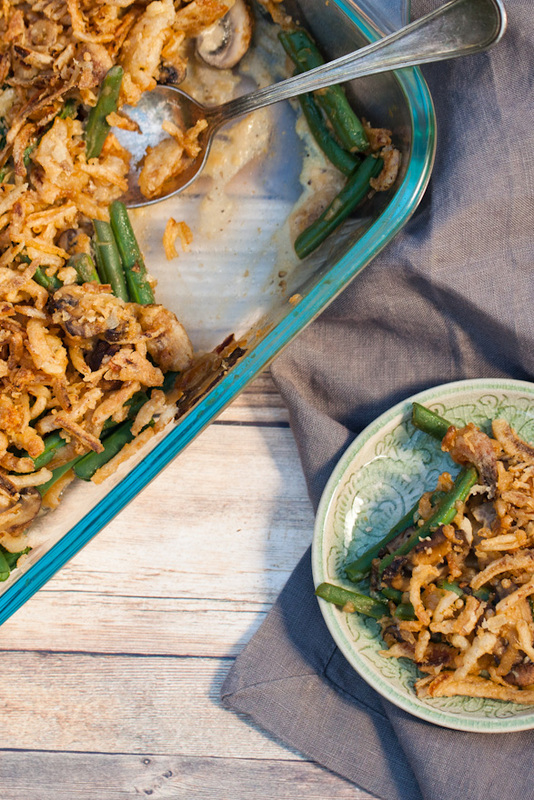 If you make this Vegan Green Bean Casserole, tell us how it went in the comments below! Or- if you really want to make someone happy for the day – post a photo to Instagram with the tag #carrotsandflowers. We LOVE LOVE LOVE when that happens! We love connecting with you all! Come say hello on Facebook, Pinterest, Instagram, and Twitter! To save this recipe, pin the photo below! Where would one find gf fried onions for on top? What brand are they? What are they called? Something, anything to start calling around inquiring about st my local grocery stores would be very helpful!